Whoever said that adults can’t play dress up now and again? Fun Central certainly didn’t. Their Black Magic gloves are the perfect addition to your sci-fi night. They even come with a guarantee, so you don’t have to worry about getting something less than perfect. 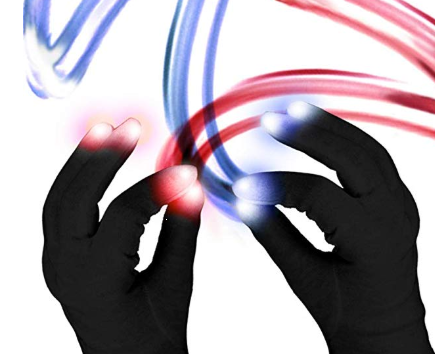 These black LED gloves have white finger tips, which will light up in 3 different colors; red, blue and green. They also have eight different modes, which will affect the LED colors that’ll appear at once. These super cool gloves are made from cotton knit, which makes them nontoxic and environmentally friendly. They are also built to last, making them a perfect gift for a more than a few games of DIY laser tag.